Ever since Jeff McCabe and Lisa Gottlieb started FridayMorning@Selmas as a breakfast fundraiser in their home 1/3 of the money has been spent, “on the food and the rest of the money goes towards the funds for hoop builds,â€ according to McCabe. 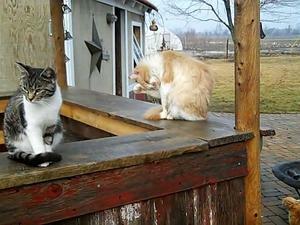 At the Capella Farm in late August, I volunteered to help with Selma's 7th hoop build. 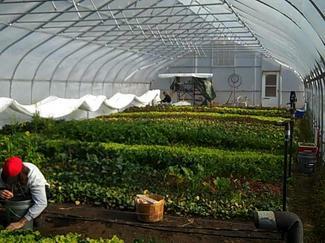 A hoop house is a plastic structure used to extend the growing season for vegetables into all four seasons of the year - a grand thing for our Michigan winters. Shannon Brines, of Brines Farm, has been overwhelmed with demand for his fresh winter greens since he began four season farming in 2004. 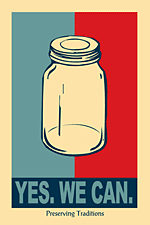 Selma's Farmers Fund will allow more farmers to augment our winter supply. 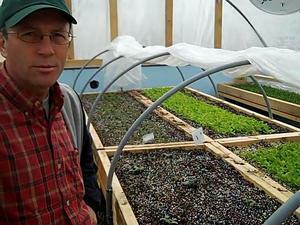 Tomm Becker, of Sunseed Farm, received his two hoop houses from Selma’s funds in August 2009 and May 2010. Becker extols the benefits of four season growing. “If we didn’t have those [hoop houses] our CSA season would be 20 weeks, from June until October. 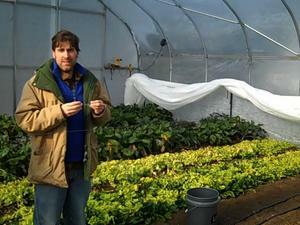 With the hoop houses we are able to continue that all through the winter, so we do 48 weeks of distribution. We take 4 weeks off because we need to, for ourselves, not because we need to for the crops. With that protected space, we increase our income by increasing our harvest, all through the winter." Jennifer and Dave Kangas started a CSA last year at Capella Farm and have had an eye on expansion. Jennifer applied for a USDA grant for a hoop house, which is administered through the Natural Resources Conservation Service, and augmented those funds with a loan from Selma’s Farmers Fund. All 75 volunteers were overseen by McCabe and Gottlieb, fed by the Kangas family, and fueled by McCabe's van full of tools. People worked Friday night and all day Saturday, August 28th, to build Capella Farm's 30 foot by 96 foot hoop house. I have never before been involved with such a large group of volunteers working together with enthusiasm and cheer to improve the sustainability of our local food. I loved every minute of it. As the moon rose over the new building silhouetted in the field, Jennifer Kangas shared her thoughts on the day. “Dave and I were so energized by all of the volunteers and support that we received to help build the hoop. Farming can be challenging because it really is hard work and you can't control the weather or the number of mosquitoes, etc. It was very affirming to feel support from the community. This day will help keep us going for a long time.â€ Capella Farm is planning on offering a winter CSA with the produce grown in the hoop. McCabe’s vision in 2011 is to raise, “20 hoops in 20 consecutive days.â€ This dream relies on increased revenue for the Farmers Fund beyond that which can be raised on Friday mornings. As such, Chef Brandon Johns, of the Grange Kitchen and Bar, is kicking off the fundraising launch of the community-supported micro loan program (aka Farmers Fund) on September 26. 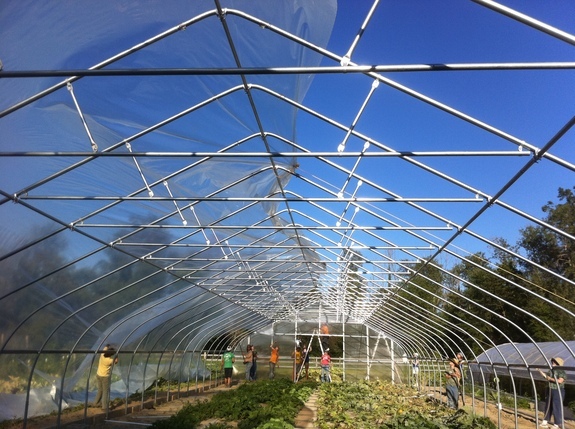 If you cannot make the fundraiser, volunteers with shovels, hammers, and portable drills will be building the 8th hoop house at Brines Farm on September 25th. One weekend, two very different opportunities to support local food. The Farmer Fund kick-off event will be held Sunday, September 26, 5-8 pm, at Grange Kitchen and Bar. The cost is $50/person, with a tax deduction of half the ticket price. RSVP to info@selmacafe.org or sign up online. 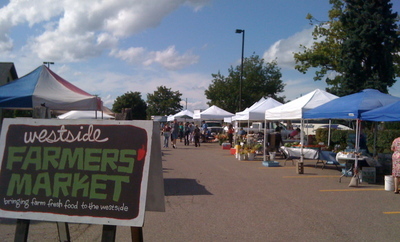 The Westside Farmers Market (the market I work as the manager) runs June through September in Zingerman’s Roadhouse parking lot (on the corner of Jackson and Maple) on Thursdays 3-7 p.m.
Ann Arbor has an abundance of food establishments. A plethora, a smorgasbord, a cornucopia, a wealth of stores to choose from - stores yes, farmers markets, ummm, not so much. The Ann Arbor Farmers Market is part of our texture as a community. It is a place of gathering, it is downtown, and it is on everyone’s radar as being “the farmers market.â€ It feeds community, provides local produce, and strengthens the relationship between the farmers and the consumers. However, if you are a new farmer wanting to find a market for your goodies during the harvest, “the farmers marketâ€ is fully booked. In 2006, Chef Rodger Bowser of Zingerman's Deli, Chef Alex Young of Zingerman's Roadhouse, Zingerman's founders Paul Saginaw and Ari Weinzweig, and many others in the Zingerman’s community decided it was time for a new market in Ann Arbor. The market started with a small band of dedicated volunteers and a handful of brave avant-garde vendors. Steadily the market grew every year until I started volunteering with it last spring. And that spring brought unexpected twists. 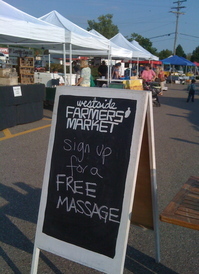 Some of you may recall the zoning issue that happened last year with the Westside Farmers Market. To summarize, the Zingerman’s Roadhouse parking lot (where the market is located) is zoned C3 by the City of Ann Arbor. C3 zoning, at that time, was not eligible for application of special use permits, therefore the market, functioning without a special use permit, was illegal. So, as of April 2009, the market was not going to take place. After a great deal of community rallying and discussions, the City told us in May to move ahead, saying they would fix the zoning over the summer, which is what they did. It was awesome. For a native of Washington, D.C., like myself, it was a beautiful example of brilliant and timely action by the wonderful hard working members of our government. 2009 was a great season. A daily average of 600 visitors visited the 28 different vendors who set up in the wind and the sun. From Bizzy Lizzy’s beet cookies, Swarm Naturals beeswax candles, Dragonwood Farm eggs and veggies, McLaughlin Farms grass-fed Highland beef, Seedling white peaches and Clare Limerick Alpaca Ranch soft wool - there was much bounty to choose from. This year we have put in our special use petition to the city and approval is expected at the City Planning meeting on May 18. When we open on June 3, we will have many alumni as well as some new faces joining us: Zilke Vegetable Farm, Nakee Natural (handcrafted soap and skincare), Inchworm Microgreens, and Portage River Farm among others. We have been approved by the USDA to accept Bridge Cards and Project Fresh Coupons. As we enter our fifth season, and I continue to receive vendor agreements, I empathize with the Ann Arbor Farmers Market vendor waiting list. Perhaps two farmers markets are not enough for all of our new farmers working to support themselves and feed their local community. We shall see what the future brings for farmers markets in Ann Arbor. If I were to purchase a CSA share in early March, I'd expect to start receiving food in May, and that abundance would continue till October (timing depends on the farmer). The dividend percentage on my initial investment burns through the capital every year, and thus I will need to reinvest in shares the following year (I have eaten all of the profits). The Farmers Marketer blog lists information about CSAs from Two Creeks Organics (I wrote about my visit to them in January), Tantre Farm, Pregitzer Farm, Portage River, Old Pine Farm Meat CSA, Needle Lane Farms, Frog Holler, Community Farm of A2, Sunseed Farm, Carpenter’s Greenhouse, and Capella Farm. I would add to this good list the Zilke Vegetable Farm, Our Family Farm and Down on the Farm - a CSA offered by the farmers in the Amish Homer Community (contact Down on the Farm, 29910 R Drive S, Homer, MI 49245, or call 517-542-2025 at 8 a.m. and ask for Amos). This list in no way is complete, but it will give you a good place to start. I recommend asking your favorite farmer at the market whether they offer one. Personally, the best thing I have found about CSAs are the relationship between the consumer and the farmers: heck, let us say it - friendships. Socialism? I don’t think so. For me a CSA embodies the relationship between an entrepreneur and an investor - and the dividends are paid in food - a very American and unique relationship. Oh say can you CSA? 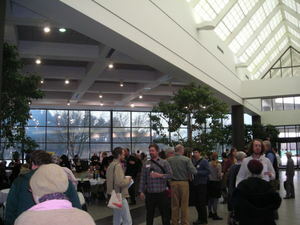 Annarbor-com, Community Supported Agriculture, Corinna Borden, CSA, Farm to Fork, Local Food, Locavore, Oh Say Can You CSA! What became clear as I spoke to Amie about their mostly community supported agriculture business model was that they are not the only ones jumping in. Their CSA customers are as well. Valley Family Farm, Garden Patch Farm (which is no longer active), and Tantre Farm were very helpful as Two Creeks Organics learned where to purchase seeds, what to plant, and how to market. One of the first things the farming community shared was that Two Creeks would need a Web site to advertise their community supported agriculture shares. There is not a lot of food available after filling the boxes. I was able to receive a box one week at the Westside Market after a subscriber did not pick up their box. It was chock full to the brim with fresh goodies - we could barely finish everything to return the box to Amie that next week. Every year Two Creeks is planting and trying to grow new things, last year it was sweet potatoes this year it could be artichokes. Amie and Mark learned last season when they tossed the seed potatoes in diatomaceous earth before planting they did not get the blight. They have a beehive behind the chicken coop to help them pollinate their crops and Amie’s father has planted an orchard to slowly mature over the years. You can check out Two Creeks Organics’ certificates online. Certified Naturally Grown is an international movement that seeks to help smaller organic farms navigate the high fees of organic certification. 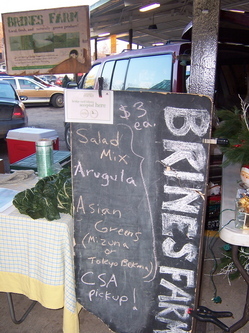 Now is the time to sign up for a CSA share for the 2010 growing season. Two Creeks Organics offers both full and half shares. I don’t think I’m alone in not always jumping for joy when I open my holiday gifts (my zenith was at age 14 when I unwrapped a festive box to find Latin vocabulary flash cards). I was recently reminded of this when hearing an economist say that we value gifts we receive from other people at about 20% of what the person spent. (I think he is being generous). 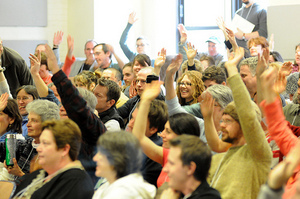 Community supported agriculture works as handshake between the consumer and the producer. You pay a certain amount at the beginning of the season and then are directed to pick up your collection of goodies weekly throughout the growing season. If you are away, you can share with your friends. Your check in January helps balance the cash flow of the farmer during the seed buying and planting season. Slow Food Huron Valley has compiled a list of certain farms around Ann Arbor and Ypsilanti that offer CSA shares. One of the best conversations you can have with your farmer at the market is to ask them if they offer a CSA share and learn about their prices and policies. 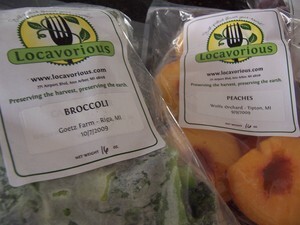 We signed up for the Locavorious CSA share over the summer. Rena Basch prepared and packaged a collection of fresh fruits and veggies during the growing season and we receive a bag monthly for four months. Our first installment included blueberries, strawberries, asparagus, squash, corn, green beans, and snap peas - all beautifully prepared to dump into a hot pan and eat. I am picking up our second installment this afternoon and hoping I can squeeze the new bounty into the freezer. 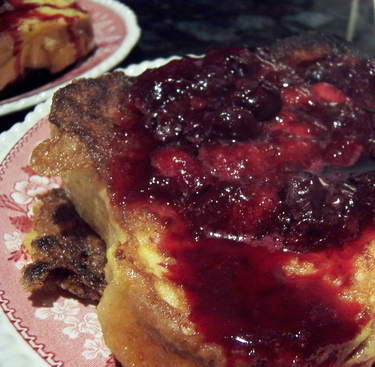 This past Sunday we threw a handful of the frozen blueberries (from Sodt’s Berry Farm) and strawberries (from Gibbs Berries Farm) into a pan with water to make a compote as we made French Toast. In 10 minutes the entire kitchen was infused with the smell of fresh summer strawberries. It was no longer 20 degrees outside and sleeting, it was June. How do you package a CSA share as a gift? Just like ordering from a catalog in front of the computer, it can be done in your pajamas - write a cheerful coupon and put it in a card. It is one concrete thing you can do this season to show your support of your local farmer. Oh say, can you CSA?! Annarbor-com, Corinna Borden, Locavorious, Oh Say Can You CSA!